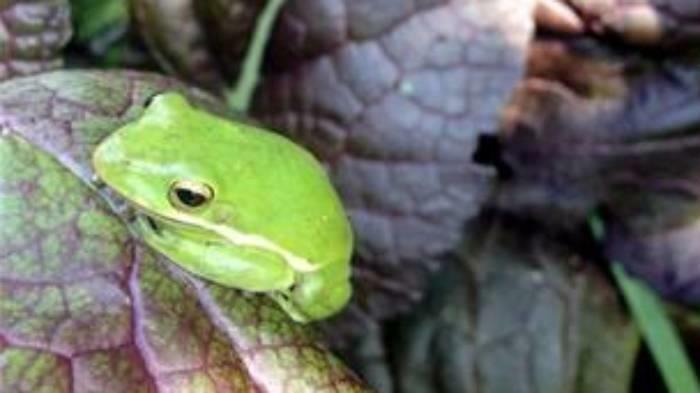 My life as a permaculture enthusiast led me to choose an American Green Tree Frog as a pet. Taught by my nature loving parents that a lot could be gleaned about an ecosystem by observing the amphibian population, I was dismayed to realize that my rural Alabama area seemed to exhibit amphibian decline. My nearby nephew, a budding ecologist, and I set about in rescue of mud puddle eggs and tadpoles several years ago, transporting the future froggies to a system of ponds designed to purify runoff as it passed through my lower yard before it hit the Cahaba River, a wonder of various flora and fauna endangered species coursing through Alabama. Along the way, my appreciation for these delightful creatures grew from curiosity to a serious concern. Surrounded by them now in my permaculture paradise, I found myself wishing that one might make his home with me, and--despite a personal vow to accept rescue pets rather than purchasing creatures--I chose to buy a pretty little guy not long later. A fairly serious force in my life, my nephew chose the new buddy for me, named him, and selected everything I might need to make his home ideal. Living in a 15-gallon aquarium, Slinky has a habitat designed to maintain proper humidity, provide creature comforts he might have chosen for himself, and allow a certain level of privacy. Among other concerns for housing are adequate substrate with maintained humidity, temperature, and lighting. Three inches of substrate allows plenty of hiding and burrowing room for Slinky, and humidity is maintained by daily spritzing. I keep his temperature at about 75 degrees Fahrenheit during the day, with a fall to the mid-60s at night. A full-spectrum light helps to ensure he gets between 12 and 14 hours of light per day. Feeding Slinky has never been a problem. He likes crickets that have been raised on fruits and vegetables, and I supplement that diet with a vitamin powder which I sprinkle over the crickets every few days. If you have a desire to have an easy pet to enjoy for observation more than play, I wouldn't hesitate to hop on down to your local, reputable pet store. Please be advised that excessive handling is neither appreciated by nor healthy for these creatures, so think twice before purchasing them for children who might prefer a cuddly pet. Frog and other amphibian care and observation may provide, though, a worthwhile scientific and ecological opportunity for the right owner.